-a stack of your favorite photos (well, copies of your favorites would be best). 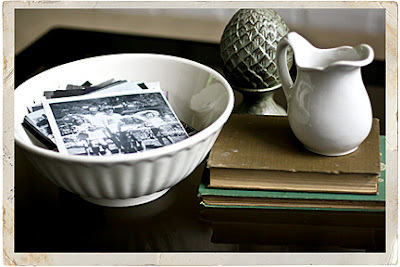 -a decorative bowl, tray, cake plate...something you love that can hold photos and a place to put it. -it couldn't be easier, just place your photos in your decorative container and put in a location that you, your family and your guests can flip through (like your coffee table). would you believe i'm still working on finding spots for things in our new place? sometimes i just stare at an object or spot and wait for the answer to come to me...and sometimes it does! like this little typewriter dilemma. i love vintage typewriters, so much that i have 4 of them, but they haven't found a spot. so i was super pleased to put 1 under my new shelves on top of some suitcases, with a photo! -if photo is a lightweight print, adhere cardstock to back. 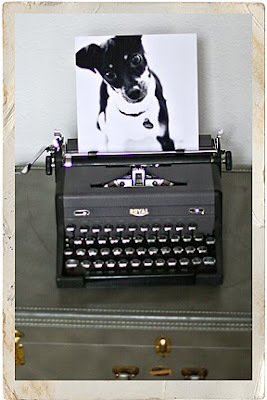 -place photo in typewriter as desired. -trim skewers if necessary and place behind photo to keep photo upright. -do you love it as much as i do?! 1 typewriter down, 3 to find spots for!